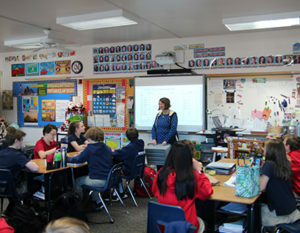 The Middle School at St. Clare School is comprised of the sixth, seventh, and eighth grade students. All students in the Middle School are one-to-one with a tablet that is used for all academic areas. The Middle School students enjoy dedicated professional teachers who teach a multi-faceted curriculum while respecting the diverse learning needs of each child. Along with departmentalized on-level and accelerated math, the St. Clare Middle School also offers specialized instructors in music, library, physical education and health, and our award-winning art program. The St. Clare School Middle School is proud that its graduates are enthusiastically accepted to local Catholic high schools. The Sixth Grade homeroom teacher is Mrs. Cathy Wade. Along with the exciting opportunity to take on more responsibility as a middle schooler, students in Sixth Grade enjoy an Outdoor School experience in the fall of each year. Sixth grade students focus their community service on environmental stewardship at a neighborhood park. The Seventh Grade homeroom teacher is Mrs. Paige Sturges. Our seventh grade students participate in many areas of our school in addition to academics. They are members of Student Council, Drama and Book Clubs, as well as the Peer Mediation Team. Seventh graders focus their community service on collecting books through a book drive for the Children’s Book Bank. The Eighth Grade homeroom teacher is Mrs. Cathy Kollars. Eighth grade students are the leaders of our school and accept many important roles including Family Group leaders, Eucharistic Ministers, and Peer Mediators. In addition to preparing for the high school experience, eighth graders complete ten hours of service outside of the school tied to Catholic Social Teaching. Ms. Jamie Nevarez is an alumnus of St. Clare School and has returned to teach middle school on-level math and seventh grade science. Ms. Nevarez helps students achieve their potential in math and science while recognizing their diverse learning styles. Ms. Melissa Cree teaches Middle School physical education to each grade three times per week with the goal of creating a love for physical activity that will continue into our students’ adult lives. Ms. Cree also teaches middle school health. Mrs. Lynn Napoli is the St. Clare librarian. Each class in Middle School has one scheduled library period each week. These library periods are used for learning experiences including literature circles, book talks, resource training, and research, as well as to check out books. Mrs. Napoli also helps guide our middle school students in Book Club and Drama Club. Our music instructor is Mr. Don Vecchione who, through classes twice a week, encourages our middle school students to dig deep into studies of rhythmic challenges. Middle school students also participate in the yearly Christmas performance highlighting their vocal talents. Our art program is led by award-winning Mrs. Marie Acurso. The art program is developmental, and the year’s instruction culminates with an annual art fair in the spring. Middle School students are encouraged to use the Language of Art to develop the ability of self-expression and communication; to make decisions and choices; and to gain an appreciation of the aesthetic properties of art created by others. Middle school students receive art instruction during a 90-minute block each week.